After our trip to the Bugaboos, Jason Cullum and I stopped to climb this Fifty Classic. When we got to the base of the route, Jason decided the route was too long and exposed for his tastes, so I continued up the 3000ft ridge alone. This was a great route to solo, with the grade a consistent 5.2 on super solid quartzite. It took me just under 2 hours to reach the summit from the col. The round trip car to car (involving 6,700 vertical feet up and back down) took 8 hours. Click on the above image for a larger view of the climbing route. On the way home from the Bugaboos, Jason and I decided to stop by Mt. Sir Donald, since we would drive right by it on our way through Rogers Pass. Mt. Sir Donald is one of the prominent mountains of the Selkirk Range of the Canadian Rockies, known for its standing as one of the "Fifty Classic Climbs" of North America. The NW Arête of this rock pyramid is composed of a solid quartzite, which offers plenty of nice ledges for steep Class 4 climbing. 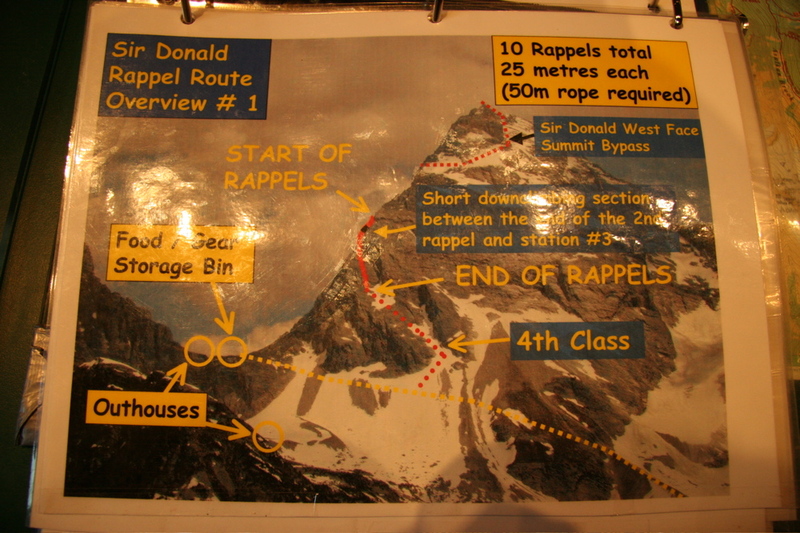 The trailhead for Sir Donald is at Illecillewaet Campground, a few kilometers west of Rogers Pass. We began hiking at 7am; we hiked fast, gaining the 4,000 ft from the trailhead (1,250m/4,100ft) to the Uto-Sir Donald Col (2,470m/8,100ft) in 2 hours. There is a trail the whole way to the col, although I mistakenly led us on the trail to the campsites below the col, so we had to do some exhausting scrambling up loose talus to regain the trail. From the col, the NW Arête stretches upwards for over 800m/2,700ft. It was inspiring to look at. Jason was so inspired that he at once felt a great need to go explore the Perley Rock trail we had passed on our way up to the col. And so I was left to solo the ridge alone. This would prove to be a cool experience. Below are photos of the view up the NW Arête and the overall climbing route. For the most part, the route is right on the NW Arête. This offered great exposure. There were a few steep low Class 5 moves that I encountered, which were quite exciting due to the exposure, lack of protection, and my bulky hiking boots, but the majority of the climb is Class 4 on solid quartzite, and I never felt the need to put on my climbing shoes or set any protection. It took me 1 hour and 55 minutes reach the summit from the col. I passed a couple of other parties along the way, but for the most part it was a quiet day on the route, despite the perfect weather. From the summit I had a nice view to the west across the Asulkan Valley (photo on left) and to the south across Illecillewaet Glacier (photo on right). To descend, I decided to take the summit bypass descent route. This involves descending a little ways down the south ridge, then dropping down and across the west face and regaining the NW Arête below the summit block. The bypass is a loose class 3 scramble. I stopped frequently to examine the cool rocks I kept finding in the loose rubble. I found a really nice outcrop of quartz crystals. After regaining the NW Arête, I downclimbed until I reached the first fixed rappel ring anchor. There is an established rap-ring rappel route down the ridge (4 rappels) and then the west face (6 rappels). 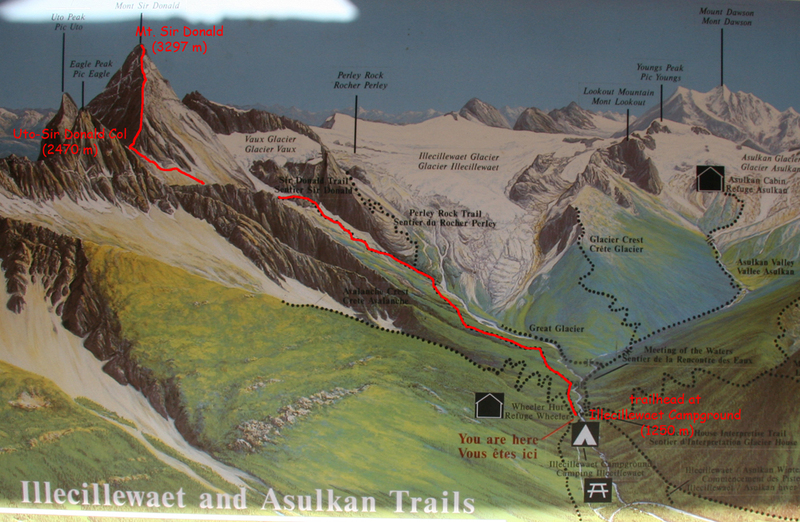 The info center at Rogers Pass offers a detailed colored description of this descent route; below is a photo I took of one page of their description. It took me 4.5 hours to descend from the summit back to the trailhead at the campground (this was 30 minutes longer than it took for the ascent!). It probably would not have taken as long if I had not stopped to examine every cool rock I saw or if I had downclimbed the ridge rather than rappelling (the rappel route is straightforward and probably safer, but someone comfortable with downclimbing would get down faster as well as avoid the loose talus at the base of the rappel route). But overall I felt I made pretty good time; I was back at the car and we were driving home by 4pm. Not bad: 6,700 ft up and back down in 8 hours. This was a fun climb, unique for its long and solid ridge climbing. It is certainly a route I would recommend soloing to those comfortable with exposure and steep 4th class climbing. Here is a nice painting of Mt. Sir Donald I found on the internet (on a Korean Mountain Club website). Unfortunately I did not get any good photos of the mountain. Update: Twelve years later, in August 2018, I returned to the area and climbed the NW Arête of Mt. Sir Donald again, this time as just one climb in a 2.5-day traverse of the Sir Donald Range from Mt. MacDonald all the way to Terminal. Click on the following link for a trip report!